While he's philosophical about his attitude to the Masters, insisting that the fact that he no longer has a "need" to win a Green Jacket to achieve personal fulfilment in no way diminishes his desire to complete that career Grand Slam, it's far more clear-cut this week. Only the 16 group winners will advance to the knockout stages at the weekend and while McIlroy knows he could face Tiger Woods on Saturday morning, he's aware that defeat to big-hitting List today could take his fate out of his hands. "It's imperative to win that first match," said McIlroy, who's lost to Soren Kjeldsen and Peter Uihlein on the opening day for the past two years and failed to progress to Saturday. "I've been on the wrong side of that the last few years and I'll try to change that tomorrow." 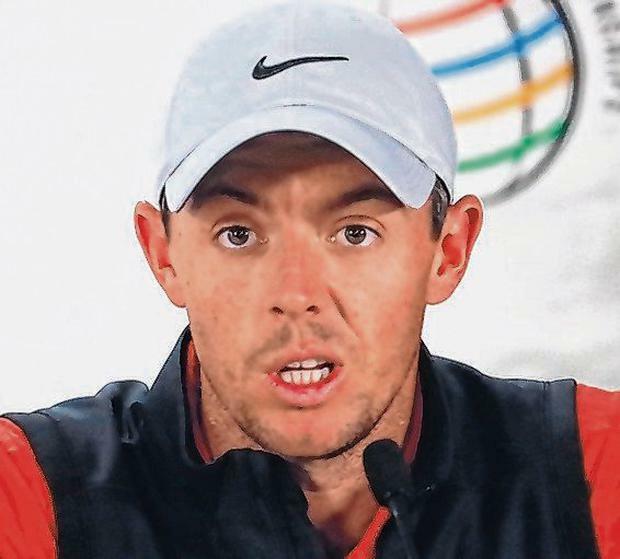 McIlroy will face South African Justin Harding tomorrow and when asked about a potential last-16 showdown with Woods, he revealed he's already texted fellow Jupiter resident and frequent practice partner Matthew Fitzpatrick about their Friday clash. "I texted 'Fitz' and said, 'Let's just make sure we have something to play for on Friday'. That's as far as I've thought ahead." It's a similar tale for Shane Lowry, who meets European Ryder Cup stalwart Sergio Garcia today and Masters champion Patrick Reed tomorrow before Friday's showdown with Andrew Putnam. Like Lowry, McIlroy might have one eye on the Masters but he insisted he is treating every day as a chance to learn. "It's not being defined by your wins and losses, that's the key," McIlroy added. "That's the secret of being freed up and not buying into narratives, not living and dying with every golf tournament or with every shot." He could return to world number one for the first time since 2015 with a win should Dustin Johnson and Justin Rose fail to make it to the last four but dismissed a previously stated goal as something that wasn't a big deal. "The big thing is winning my match tomorrow," he said with a grin. "That's the first step in the process. Winning tournaments, getting to number one and all those accolades are a by-product of doing all the little things right. I feel like I am doing all those things right and step by step they will add up to all that stuff that other people find important." While it's clearly all about the Masters for McIlroy until he finally gets that Green Jacket, he insists his new balanced view is the only way to approach life. "There's a difference between a personal desire and a need," he said. "A few years ago I would have said, 'I need to win a Masters, I need a Green Jacket.' Now I 'want' to but if I don't I'm OK. That's the difference.'" Believing that all he can do is learn from each experience and let the cards fall how they may, he added: "Do I have a desire to do it? Yes. Do I have a need to do it? No." Brian Keogh Seamus Power could look on the bright side despite dropping four late shots in the second round of the weather-delayed RBC Heritage in Hilton Head.